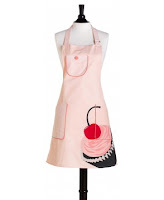 When I stumbled across apron website I fell in love. I could not belive how beautiful their aprons are. 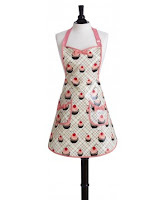 I have always wanted an apron since i was a kid from watching I love lucy and the dramatic house wife series from when i was a kid. I always wanted to play little miss home maker when everyone else wanted to play with barbies, and play on the swings. When i started looking through their aprons It reminded me of my childhood all over again. But Being grown up I actually have to play "Little miss home maker" Being a wife and all. I love being in the kitchen to this day, But having a Jessie Steele apron make it more enjoyable and playful. I love Fru-Fru stuff and what I love more then Fru-Fru Stuff is "Cupcake" Fru-Fru stuff! I adore it! 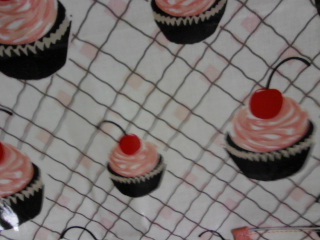 I love the taste of cupcakes and the cuteness of cupcakes. So when I came across this apron i KNEW it was the one. I originally was going to go with a regular cloth apron but My brain said Whoa..Whoa.. No way! When I'm in the kitchen my clothes misterically get stained, Stained so bad my stain remover can not remove the stains. I still think it's those pesky stain gnomes that live in the cookie jar. 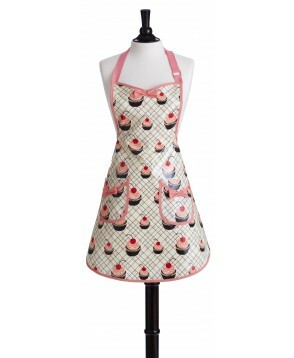 But I opptied for the clear coated apron with the same print. So adorable! 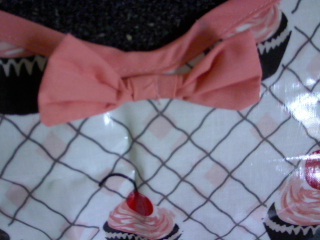 My apron came with a pastel pink pockets that match the color of the cupcakes, The pockets have cute Fru-Fru bows on each side. The apron is heavy duty so it won't crash and burn while being in the washer. Best made apron I have ever seen. The plastic coating of the apron won't stain and it will wipe off with just water which is a huge plus considering how messy I always get. This is the print of the apron I received to review, Chocolate cupcakes with pink and white frosting with a cherry on top. Every time i see this print it brings a smile to my face, And my kitchen is much happier. The background is white with vertical brown stripes. 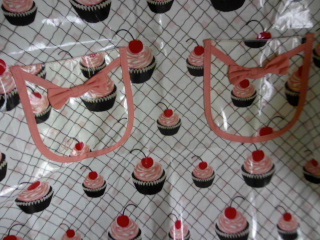 This is the neck line, As you can see theres another cute matching Fru-Fru bow that gives it a girlie girl touch, Like the cupcakes doesn't do that enough *Smiles* Jessie Steele has tons of styles, colors, and designs to choose from, I decided on the Chef's apron for the "Full coverage" that i need while in the kitchen, But Jessie Steele has hostess aprons, along with Kids aprons for your little ones can play little miss home maker with you. ♥ I receive no monetary compensation for this review. 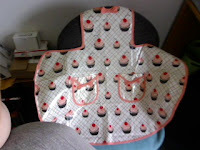 I was provided a Jessie Steele apron to try and give my honest opinion.